As a child, I remember how my parents couldn’t function without a cup of tea. On Sundays, before the four of us could hop onto the Bajaj Vespa (I stood in the front and pretended it was an airplane); at story time on Saturday mornings; during the make-believe school I started when I learned to write—Mum and Dad needed a strong cup of tea that, to me, always made the difference between “right now” and “in a while”. Of course, I grew up hating the brown, milky drink that kept me from everything I loved! It was no surprise, then, that I, like the rest of my generation, embraced the coffee culture with a vengeance. It was my way of telling tea to go to hell. Tea comes with a social aspect that we don’t appreciate enough. 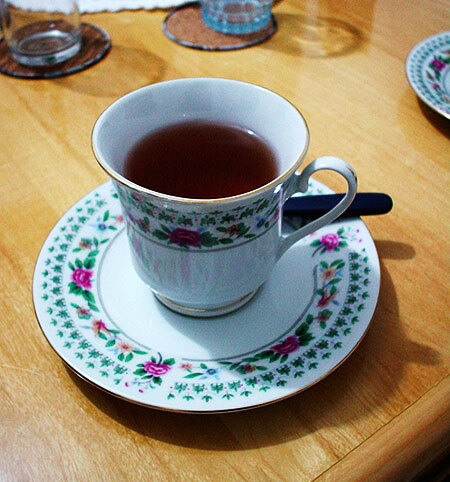 But as I got older (and more mature) this hatred for tea started to dwindle. I found out soon enough that tea didn’t dehydrate me the way coffee did. It made me feel alert without making my ears, eyes, and mind buzz with hyperactivity. But most importantly, it didn’t leave a bitter taste in my mouth that eventually morphed into stale “coffee-breath”. As I started writing about food in Mumbai, I also came to appreciate how versatile tea could be in the kitchen—the chai poached chicken from Aurus and jasmine ice cream from Koh (by Ian Kittichai) had a part to play. So with my birthday just around the corner, I started thinking about tea a whole lot. Not just tea, but the entire entourage that follows it around: biscuits which are sweet, salted, baked with coconut, or slathered with cream, in addition to farsan, tea cakes, deviled eggs, mini cucumber and chutney sandwiches, the list is endless. There are also different types of teas to reckon with—black, green, oolong being the basic varieties—not to mention first flushes and flavoured varieties with recommended brewing times, depending on whether you want your drink mild, medium, or strong. Add to this the different names for the tea-centric ‘meal’ depending on what time of day you serve it: Elevenses, Afternoon Tea, and High Tea. But what did my birthday have to do with this? I’ll tell you what. In India, we’re simple. We just drink our brew as a sort of necessity without actually taking time to savour or sweeten it up with a menu. The most Mum and Dad still do is throw in a portion of Marie or khari Biscuits. This is more so true in Mumbai: we don’t have the time, inclination, or the wardrobe for elaborate tea-time rituals. It doesn’t help at all that we’ve turned into pros at drinking spirits. We attend elaborate beer tastings, elegant wine and food pairings—heck, we’ve even partaken in a cigar and malt club at least once in the last two years. But with this spirited lifestyle, we’ve started to wake up ruing our excesses. It’s not tough to see that socialising is getting to be dull without the prospect of a beer or three. I have spent the last eight birthdays doing “something different”, by which I mean, getting drunk on a different spirit and dancing at a different nightclub. It was fun at the time but in retrospect, unfulfilling. There is an immense need to go back to a simpler time when alcohol was cheap, but not in style, whereas tea, available in abundance, was. Tea helps us appreciate how the grogginess goes bye-bye after an afternoon nap. It puts our gears into motion as we start a new day. It also keeps us alert when we’re forced to pay attention to someone with the I.Q. of a four-year-old. Most importantly, tea comes with a social aspect that we don’t appreciate enough. One that calls for a vast spread of delectable goodies which taste like heaven when dunked, and prolonged chats that keep getting better with each refill. This year, I did something truly different for my birthday. This year, I threw a tea party and invited my guests to join me in the revolution against the tide. Did they go with the flow? Or did the ceiling come crashing down on the teacups? Find out in Part 2 of The Tea Party! Afsha is a Mumbai-based writer who wants to use this space to move food culture away from fads and popular trends. Read pages out of her food diary here.